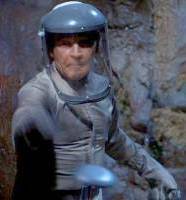 Nelson, Crane and physicist Dr. Land enter an underwater cave to get samples of Zycron 143, an element which could be the ultimate weapon in the wrong hands. 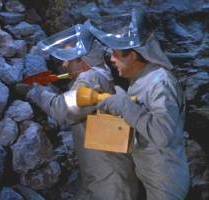 Nelson, who has been brainwashed by an enemy power, takes a sample and then tosses explosives which trap Crane and Land in the cave. 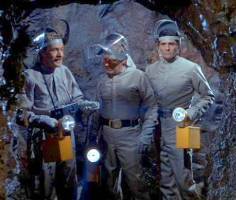 Dr. Land, Nelson & Crane in cave. Nelson gives heave-ho to bomb. Nelson returns to Seaview with the story that the other two are dead. Sharkey and Patterson dive down to investigate, even as Seaview is rocked by an undersea quake. In his cabin, as Nelson radios the location of the cave to the enemy, Chip picks up the unauthorized signal emanating from within Seaview. 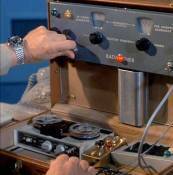 Kowalski sets out with a detector and traces the signal to Nelson's cabin, where the Admiral knocks him out with a stun-gas. Nelson in cahoots with the enemy. Sparks tips Morton off about spurious signal. 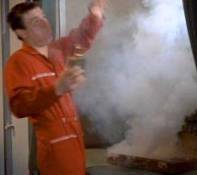 Kowalski's stunt double gets gassed. 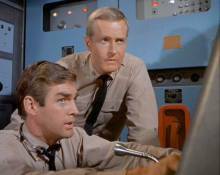 As Sharkey and Patterson enter the cave and search for Crane and Dr. Land, another undersea quake almost buries the two would-be rescuers in rubble, but they finally get through to Crane, who warns them about Nelson. On Seaview, Chip reluctantly orders the Admiral detained. 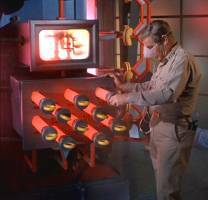 The brainwashed Nelson eludes the search and eventually pulls the dampening rods on the reactor. 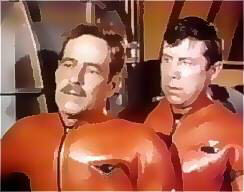 Having effected their rescue, Sharkey and Patterson lead Crane and Land back to Seaview where Crane tries to reason with the mind-controlled Nelson. 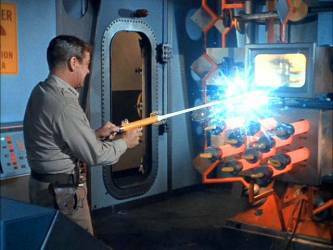 Nelson shoots Sharkey as he tries to shut down the reactor and Dr. Land fires a low-voltage charge at Nelson, noting it may bring him out of his brainwashed condition. It does, and Nelson saves the day in the nick of time by firing a laser beam into the reactor, short-circuiting it from going critical. He is himself again and the enemy has been thwarted. Mouse over for hot ray-gun action! Mark Says: Another great teaser, as Nelson seals Crane in a cave but the rest is standard stuff. The enemy voice is kind of amusing, issuing no-nonsense commands to Nelson. Guest star Arthur Space turns in a hilariously flat (yet likeable) performance as Dr. Land. 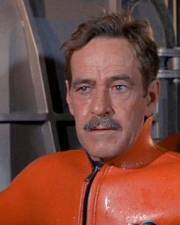 Arthur Space as Dr. Land, and Patterson.